B.Sc. (2002) and M.Sc. (2005) in Electrical Engineering at the Technion. 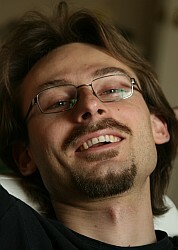 Ph.D. (2007) in Computer Sciences at the Technion. Alex included advanced courses from different departments in his curriculum. "Expression-invariant 3D face recognition" under the supervision of Prof. Ron Kimmel. This project has gained certain attention from the world-wide media including CNN. "Blind deconvolution of images" under the supervision of Dr. Michael Zibulevsky from the Faculty of Electrical Engineering. Full list of his publications includes journal papers, conference papers and patents. Alex was one of the inventors of the 3D sensor technology that he started developing at the Technion 10 years ago with Michael Bronstein and Ron Kimmel. The Israeli company Invision was founded on this technology and acquired by Intel in 2012.